Mr Prakash Gupta, DCM Embassy of India (center) inaugurates Best of India KNITE 2018. Also featured (left to right) are Mr V Thiyagarajan of TVS, Mr Amol Titus of IndonesiaWISE and Founder KNITE, Ibu Elisabeth Rukmini, Vice Rector of Universitas Katolik Indonesia Atma Jaya and Bp Irenius Dwinanto Bimo, Dean Faculty of Business and Economics. Like India, Indonesia is a very young country with sixty five percent of the population below the age of 35 years. Over 2 million Indonesians join the labour force each year and this is resulting in a huge challenge for the country in terms of providing gainful employment. Another equally important challenge is to ensure that the youth have the right academic preparation to be able to meet the tough requirements of industry. While many concerns are being expressed in this direction it is heartening to note that a pioneering initiative Best of India KNITE launched by the well known senior strategic advisor, writer, educationist and mentor, Mr Amol Titus, is helping to address this issue. 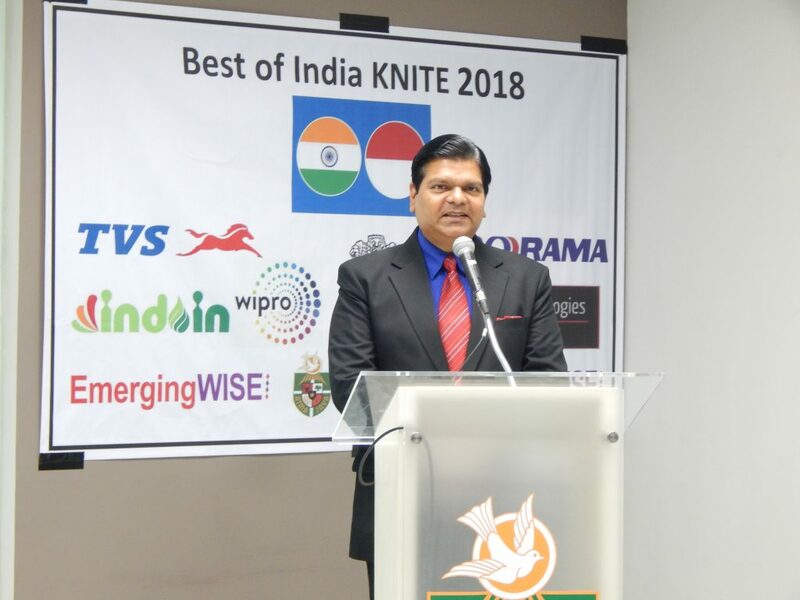 Ms Poonam Sagar of www.indoindians.com spoke to Mr Amol at the side lines of the Best of India KNITE 2018 event held at Universitas Katolik Indonesia Atma Jaya on 27-28 November in Jakarta which was inaugurated by Mr Prakash Gupta, Deputy Chief of Mission, Embassy of India. P.S : Congratulations Amol on the successful completion of Best of India KNITE 2018. Can you tell us about the highlights of the event this year? A.T : Thank you Poonam. KNITE is an acronym that I have coined and it stands for Knowledge-IT-Engineering which I believe are three pillars of sustained business and economic growth. 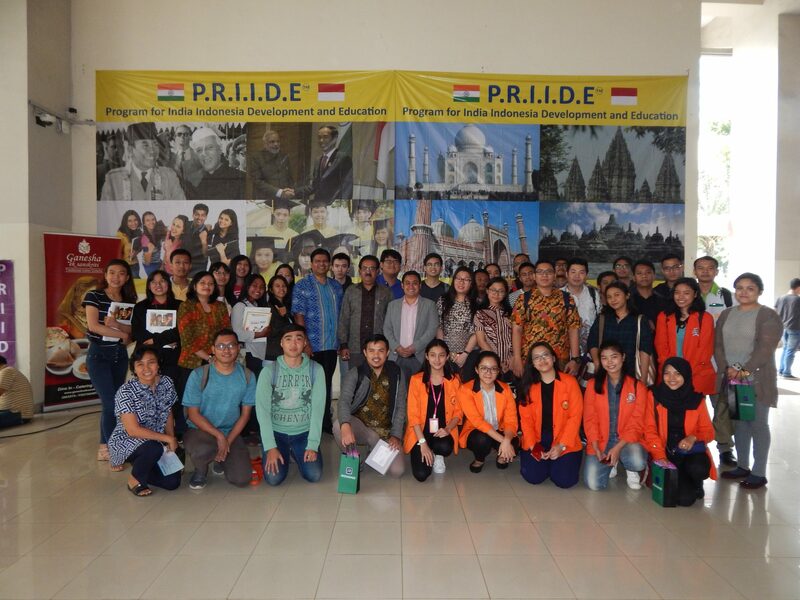 Best of India KNITE showcases achievements of India in these fields and this program, that was launched in 2016, rotates annually through leading Indonesian universities. As in previous years there were 3 major objectives of the program. First, as I have repeatedly opined in my writings and talks on the India-Indonesia relations, the foundation of our friendship rests on people-to-people contacts. For centuries people sailed to and from both countries, made connections and forged common bonds. These bonds helped both nations fight entrenched colonial powers and navigate the complex birth pangs experienced in the aftermath of independence. These bonds need to be refreshed in order to be meaningful to each generation. Unless the youth of the country appreciate the historical ties and more importantly the relevance to their current situation and challenges. 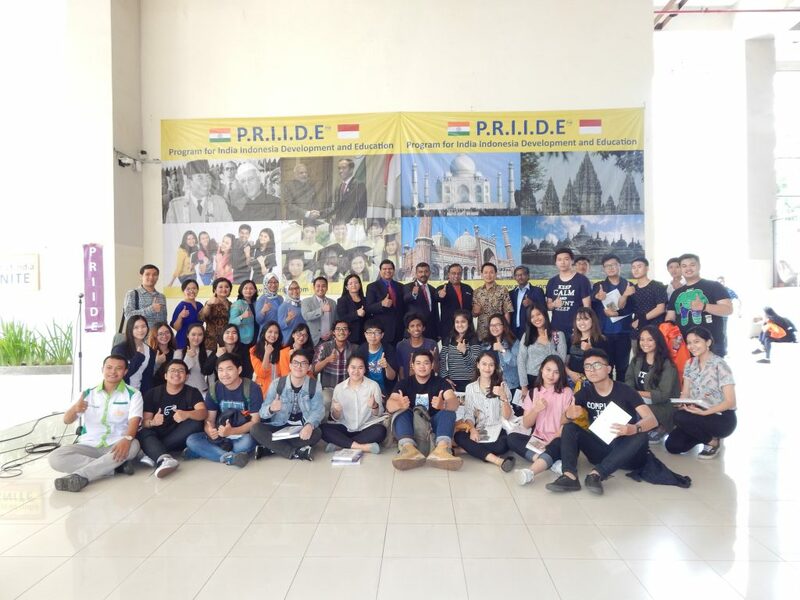 Best of India KNITE 2018 helped hundreds of youth at Atma Jaya campus in the centre of Jakarta to connect with India through an exhibition, seminar, audio-visual displays, networking and activities. Embassy of India also provides books and catalogues that are distributed to students. Second, while cultural connections should be emphasized it is equally important to highlight India’s substantial achievements in science, technology, renewable energy (especially solar and wind energy), metro railways, infrastructure development, digital connectivity etc. It is the combination of Knowledge, IT and Technology that has helped to propel India as the 6th largest economy that is on the cusp of overtaking UK and becoming a USD 2.7 trillion economy shortly. There is low awareness in Indonesia about India’s achievements in these fields and it is vital to rectify this as the Indonesian youth of today will become the professionals, officials, decision makers and entrepreneurs of tomorrow. Best of India KNITE helps to boost this vital awareness and understanding. Third, in the current scary economic scenario of “jobless of job-lite” growth it is critical that youth possess the right skills and competencies in order to embark on careers of their choice. In my experience as a visiting professor of management at several Universities across Indonesia, I have found that a significant gap exists between the curriculum, teaching methodologies and ground realities and expectations of industry. Unless theory converts into skills and skills convert into competencies, youth will struggle to qualify during selection processes and more importantly survive in the tough economic environment. Businesses and industry often bemoan the lack of suitable talent, but my response has always been that complaining only contributes to the problem and not to the solution. Best of India KNITE adopts a collaborative mentoring approach under which senior officials from leading Indian owned or managed companies, invest time and effort in updating youth about their respective sectors, corporate philosophies, success factors and achievements. They also provide professional and career guidance to students. Apart from attending presentations, participants can also learn from the learning-oriented exhibition and display that is a central feature of the event. Best of India KNITE is the only annual event that comprehensively covers the above three objectives in Indonesia and in our journey IndonesiaWISE, EmergingWISE and PRIIDE (Program for India Indonesia Development and Education) have been joined in good spirit by Embassy of India, leading companies, academic institutions, academicians and media. P.S : Was there a specific theme this year and who were the main participating companies? A.T : This year the hosting department was Faculty of Economics and Business at Atma Jaya University. During our preparations we agreed to showcase the theme of Sustainable Business Development. This is very relevant as Indonesia is facing serious environmental concerns like India of vehicular and chemical pollution, plastic waste, over-dependence of fossil fuels, water shortages and damage to fragile coastal and riverine systems. Through my strategic advisory and consulting work I am aware that several Indian companies in Indonesia have adopted “best-in-class” sustainable practices. These were shared with students and faculty at Best of India KNITE 2018. PT Indorama Synthetics Tbk shared achievements in sustainable business development in petrochemicals and textiles specifically carbon footprint management, eco products, industrial safety and CSR. PT TVS Motor Company shared innovations in the two and three-wheeler segment such as excellence in design, fuel efficiency and usage of new generation of materials. PT Medisafe Technologies shared operating excellence achievements in medical gloves production with emphasis on new product development, automation and quality control. PT IndoIn shared insights related to the agribusiness sector and tips on entrepreneurship. PT Unza Vitaliz (Wipro Group) highlighted sustainable practices in the fast-moving consumer goods (FMCG) sector with several achievements related to packaging, waste reduction, green manufacturing and quality control circle (QCC) led innovations. PT IndonesiaWISE shared its expertise in development of eco- tourism that is supporting the national goal of attracting 20 million tourists by 2020, with projects and capacity building carried out in key destinations like Yogyakarta-Borobudur-Prambanan and Malang-Bromo-Tengger-Batu. BHEL shared expertise in capital goods produced for the power sector and expertise in manufacturing turbines for a range of fuels including gas and biomass. Thus, students got valuable insights into 7 key sectors of the economy and practical contributions to sustainability made by committed organizations. At the exhibition students were also shown India’s achievements in space technology through the remarkable track record of ISRO (Indian Space Research Organization) and sustained growth of metro railways led by Delhi Metro Corporation. P.S : How was the student and faculty response? A.T : Many students were quite pleasantly surprised and their experience was an eye opener. They showed eagerness to learn and connect more with showcased projects and participating companies. Youth have energy and are tech savvy so by increasing awareness and pointing them in the right direction we can quickly see desired results. To make their experience holistic, a Bharat Natyam dance and Legong dance recital were also performed and students got a taste of Indian cuisine through specially prepared lunch and snack boxes. Many were tasting Indian cuisine for the first time and they gave it a big thumbs up. One group of students also presented their start up idea to senior industry professionals and got useful inputs regarding next steps. The University faculty has expressed a keenness for identifying future avenues of collaboration related to research, internships and socialization of career opportunities. 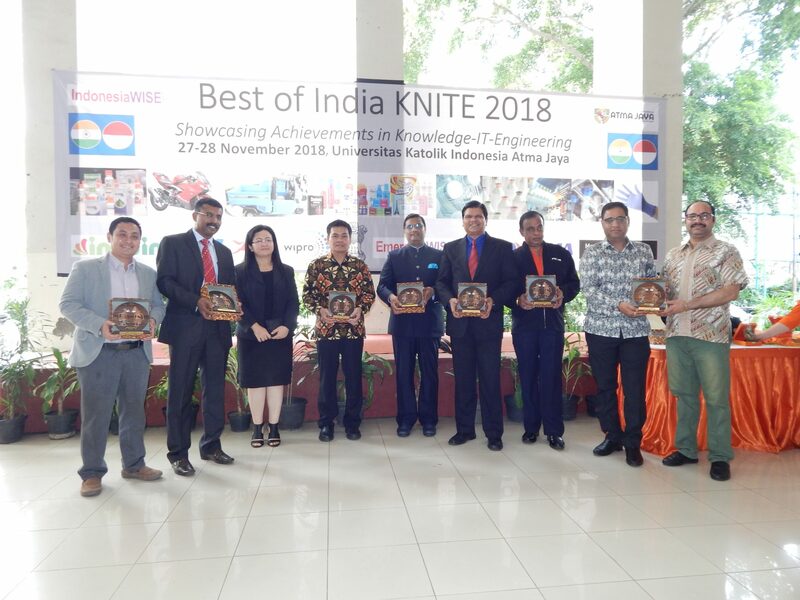 In this manner Best of India KNITE is helping to bridge the industry-academia gap and is assisting leading Indian organizations operating in Indonesia to get closer with prominent Universities and Institutes. P.S Congratulations on this wonderful achievement Amol. On behalf of the IndoIndians community, I can say that we are proud of your many contributions to India-Indonesian relations through education, literature, seminars and facilitation of economic ties. A.T Thank you very much. If other companies want to join Best of India KNITE 2019 please contact us as this is a positive and collaborative contribution of India to Indonesia. Featured above (left to right) are Bp Irenius Dwinanto Bimo, Mr Amol Titus, Ms Archita, Ms Ana Jati and Mr Prakash Gupta at the conclusion of the Best of India KNITE 2018 cultural performance. 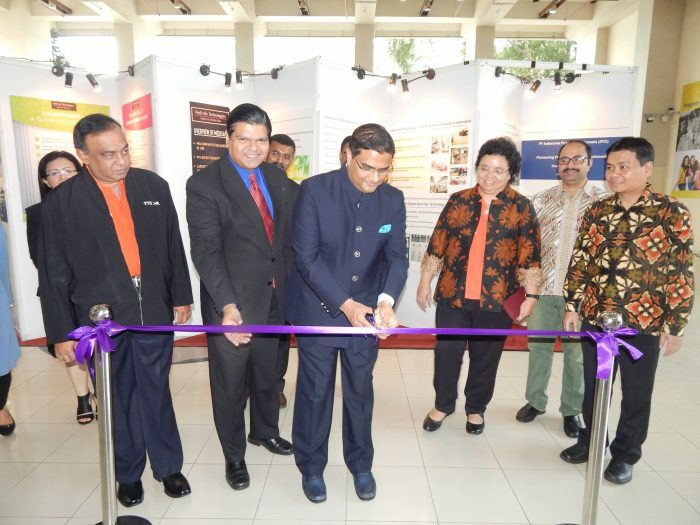 Featured above (left to right) are Bp Adi Sumarno (Wipro-Unza), Mr Sajeev Joseph and Ms Rosma Silitonga (Medisafe Technologies), Bp Irenius Dwinanto Bimo (Atma Jaya), Mr Prakash Gupta (Embassy of India), Mr Amol Titus (IndonesiaWISE), Mr V Thiyagarajan (TVS Motor Company), Mr Pradeep Bahuguna and Mr Akshay Thukral (IndoIn Group) at the Best of India KNITE 2018 inauguration. Best of India KNITE Founder Mr Amol Titus address delegates at the opening session. He provided an overview of India’s achievements in Knowledge, IT and Engineering and the importance of creating win-win linkages around these between the two countries. Flanking Mr Amol Titus are Mr N Srikanth (right) and Mr Ahmed from PT Indorama Synthetics Tbk. Best of India KNITE especially invites talented and rising Indonesian professionals to emphasize commitments of Indian owned/managed organizations to Indonesian talent development. This also provides inspiration to students seeking meaningful career opportunities. Smiling faces and happiness experienced by Indonesian youth underlined the successful conduct of Best of India KNITE 2018 at Atma Jaya campus in Jakarta.